Analytics are a holy grail for throughout the process of planning and building a website as well as a handy reference guide for managing your website after launch. You can track users on your site, where they are coming from, what kind of content attracts the most users, and what sorts of devices they’re using (tablets, smartphones, and laptops: oh my!). This kind of information is invaluable whether you’re starting up a new website or looking to improve a current website. Analytics should be the first place you turn when making decisions about the future of your website. In this blog, I’ll highlight some of our favorite web analytics tools and when you should be using them. Keep reading to learn more! TL;DR—It’s free, easy to install, and comprehensive. Google Analytics is the simplest web analytics tool out there, but it’s a true heavy lifter. We use Google Analytics on nearly all projects. It is the foundation for collecting information from users on your site. While it’s not the most comprehensive solution, it is usually the best fit for most projects because it covers such a large breadth of information and it’s free to boot. You name it, they have it: everything from advertising performance, to audience behavior, and to conversion rates. TL;DR—It’s Google Analytics with a V8 thrown in; also known as Omniture. If you feel limited by what Google Analytics provides or you are looking to expand your analytics beyond just your website, Adobe Digital Analytics may be able to help. Adobe purchased Omniture in 2009 to be able to start offering offline and online analytics tools for businesses looking to track their marketing efforts. They’ve expanded the platform to be one of the most comprehensive analytics platforms on the market, but tread carefully… it can get expensive. TL;DR—Boost your site’s Google search capabilities. Google Webmaster Tools is an essential, free resource to use. For most sites, Google’s search engine is a good indication of overall SEO performance, so what better source to use for insight than Google? 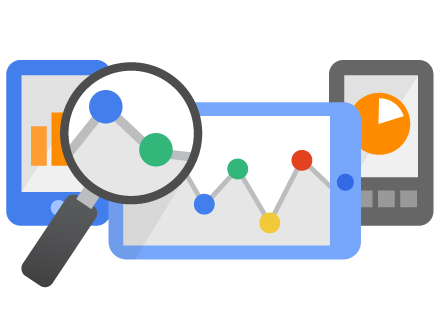 With Webmaster Tools, you can better understand and monitor your site’s performance in Google Search, and includes data on site qualities like backlinks from other sites, queries that lead to visits (and queries that don’t), internal links, and which pages Google has indexed. If you want to know more about how your site’s doing in Google searches, Webmaster Tools should be your first source. TL;DR—Provides analytics from the sources of social engagement. Moz has become a single source for in-depth analytics of backlinks, trending keywords, social referrals and overall site organization and optimization. They offer a paid plan that covers all the basics for providing actionable items to improve your rankings in search engines and track your competition. TL;DR—See where your users are clicking, what they’re looking at, and the size of their screen. Crazy Egg is the peanut butter to the analytics jelly. This service provides a way to visualize your users While Google Analytics is starting to serve some of this functionality, Crazy Egg is still the leader when it comes to understanding how users interact with your site. If you have a Facebook Page and are a Page Manager, Facebook hasn’t left you out of the analytics circle. With Insights, you have access to a number of different metrics including Page engagement, likes, visits, reach, and shares. Although Insights doesn’t exactly predict what content will be successful, you’ll have a much better idea of what draws your readers’ eyes. Similarly, with Twitter Analytics you can get a sense of what content is performing the best and in what way users are interacting with it. Not as robust as Facebook’s Insights, but it’s recently out of beta. Keep an eye on it. There are many analytics tools out there for you to use to improve your website’s performance. These four are just the tip of the iceberg. Our strategists, designers, and developers can make even more recommendations for you and your website. Interested in learning more? Drop us a line today!